The blonde mustache was gone. 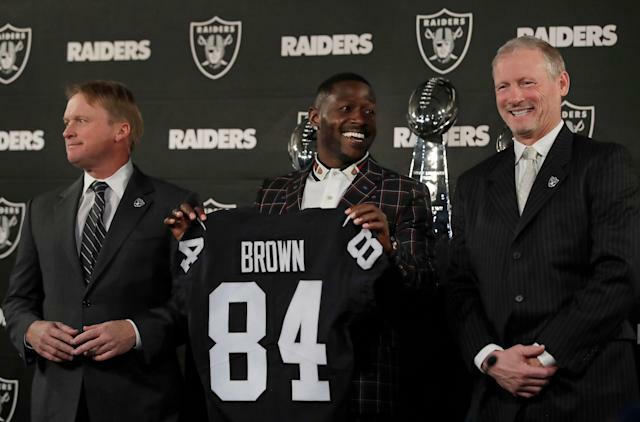 But his trademark smile was in full force on Wednesday when the Oakland Raiders officially introduced wide receiver Antonio Brown as the crown jewel of their offseason acquisitions. A beaming Brown sat between head coach Jon Gruden and general manager Mike Mayock in front of a backdrop of the franchise’s three Super Bowl trophies, a less-than-subtle suggestion of the expectations that come with the arrival of the team’s new All-Pro talent. Gruden was practically giddy when talking about Brown as the team performed a victory lap over the deal that brought him from the Pittsburgh Steelers, a stark contrast to the much-criticized ouster of Khalil Mack last offseason. Gruden went on to reiterate his oft-cited mantra that rebuilding the Raiders in his vision will attract talent and that Brown is a step in that direction. “When we signed Antonio Brown, you would be shocked at how many other players have wanted to come along with him,” Gruden said. Gruden said in November that “players are dying to come here.” But like on Wednesday, he declined then to cite his sources on the influx of talent lining up to wear silver and black. Mayock told reporters that the asking price for Brown was initially too high for the Raiders to consider. But when the reported deal to send Brown from Pittsburgh to the Buffalo Bills fell through last week, the Raiders jumped back into negotiations. The Raiders acquired Brown for a third- and fifth-round, a bargain for a receiver considered by some to be the best in the game. While Brown is not the piece to push the Raiders into the realm of contention, his addition is undeniably a step in the right direction. And Oakland got him at a discount. As for what Brown had to say? Not surprisingly, he talked about individual goals that include encroaching on some of the NFL’s least attainable records. As for the disappearance of that blond mustache? “I'm trying to make a professional impression. Keep it low-key."